As national and regional economies recover from the most severe global recession since the Great Depression of the 1930’s, there is a growing emphasis on the importance of innovation for sustained economic growth and competitiveness in today’s global, fast-paced, knowledge-based economy. Not only is innovation critical for industry development, it directly impacts the standard of living found in a nation and its regions. 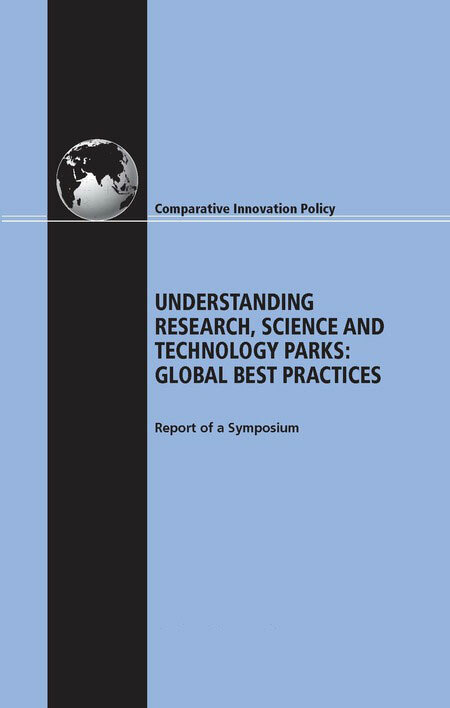 University research parks are a successful way to advance innovation and create economic growth in regions across North America, according to a new report, “Driving Regional Innovation and Growth,” prepared by Battelle’s Technology Partnership Practice (TPP) in partnership with AURP. Further, university research parks are an effective way to create new employment opportunities for existing technology companies, according to the report. 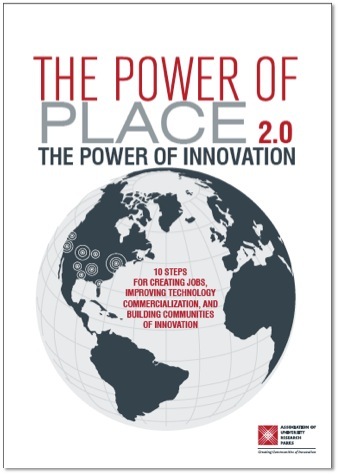 The Association of University Research Parks (AURP) released The Power of Place 2.0: The Power of Innovation in 2010. The Power of Innovation, an update to The Power of Place: A National Strategy for Building America’s Communities of Innovation, outlines the role the federal government can take to use research parks and other innovation assets to create jobs and remain a front runner in the global technology competition. 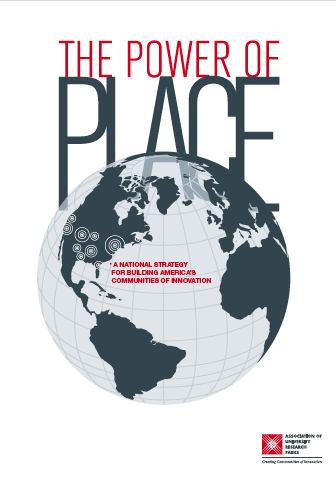 Download the Power of Place 2.0. Download The Power of Place. University research, science and technology parks are strong economic engines and contribute to the economic development of local communities, states, and nations. 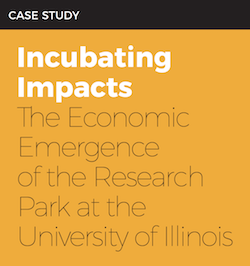 Below are studies that illustrate the economic impact of university research parks. The systematic development of linked Communities of Innovation greatly influences the economic health of regions, as shown in the reports below. For more information on AURP and university research parks, contact AURP Headquarters. 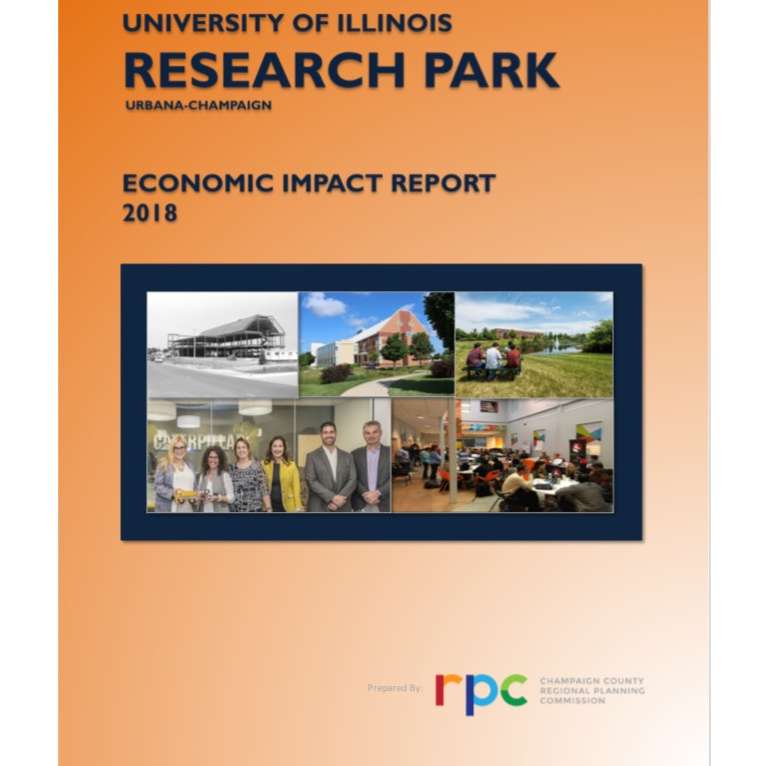 The University of Illinois System (the U of I System) creates a significant positive impact on the business community and generates a return on investment to its major stakeholder groups— students, taxpayers, and society. Using a two-pronged approach that involves an economic impact analysis and an investment analysis, this study calculates the benefits received by each of these groups. Results of the analysis reflect fiscal year (FY) 2016-17. 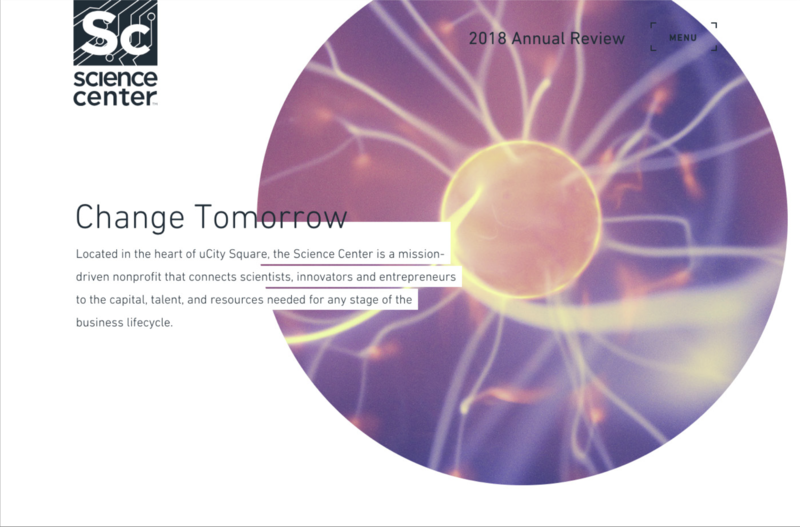 Located in the heart of uCity Square, the Science Center is a mission-driven nonprofit that connects scientists, innovators, and entrepreneurs to the capital, talent, and resources needed for any stage of the business lifecycle. This 2018 Annual Review covers the milestones and figures at the Science Center. The University of Arizona Tech Parks Arizona seeks strong growth for Arizona's economy after recording a $2 billion impact on the state, according to its annual report. If you've never heard of the Research Park at the University of Illinois at Urbana-Champaign, remember the name. It's a big deal. The results of the Research Park's study were staggering. Its findings finally revealed what the park had been specifically contributing to the local economy and workforce over the previous decade. This included almost 2,000 jobs created in the region and hundreds of millions of dollars that impacted the University and surrounding counties. 2016 marked a year of tremendous progress for the Buffalo Niagara Medical Campus (BNMC). From construction projects dominating the Campus landscape to further attraction among companies and entrepreneurs drawn to the amenities and energy found here—the momentum has reached new heights and we’re just getting started. 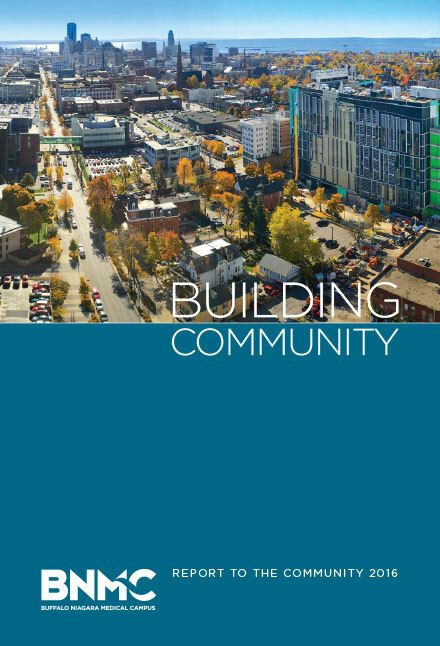 BNMC is a self-sustaining social enterprise formed to coordinate the ongoing development of the Medical Campus and address issues common to the Campus and its partners. The Sandia Science & Technology Park (SS&TP) is a 300+ acre master-planned technology community. Affiliated with Sandia National Laboratories and adjacent to Kirtland Air Force Base, companies have access to world-class facilities, technologies, scientists, and engineers. The results of an economic impact analysis conducted every two years by the Mid-Region Council of Governments (MRCOG), assessed the Park’s economic impact from its inception in May 1998 through the end of 2015. The new, independent report highlights that the SS&TP has benefitted the local economy for nearly 19 years through job creation, increases in state and local tax revenues, and higher-than-average wages for its employees when compared with the average wage in the Albuquerque metro area. Graduate firms and current residents of the University City Science Center’s business incubators support one out of every 100 jobs in Greater Philadelphia and drive nearly $13 billion in economic activity in the region, according to new analysis released today by the Economy League of Greater Philadelphia and Econsult Solutions, Inc. 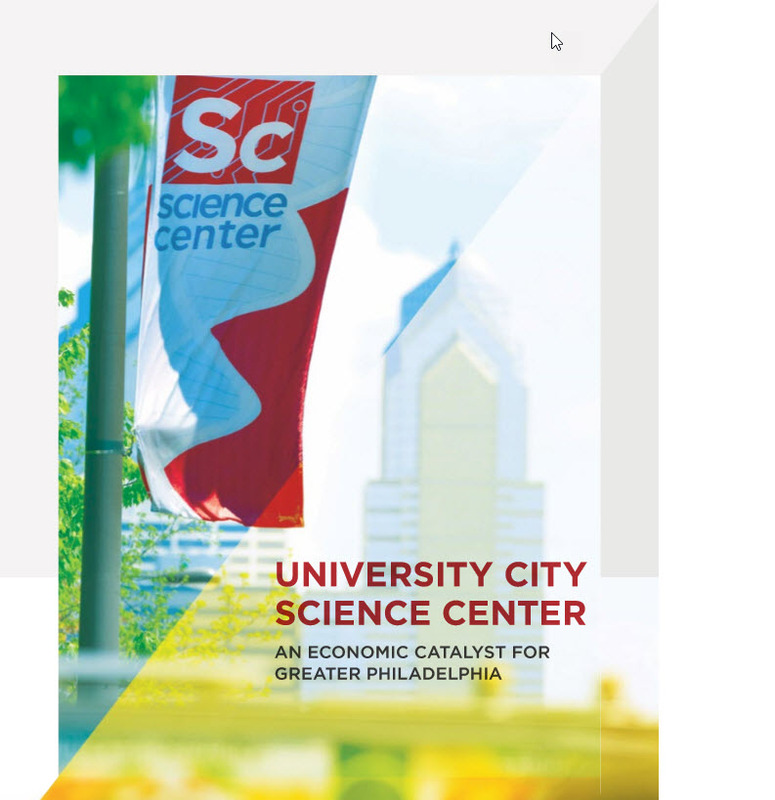 The University City Science Center: An Economic Catalyst for Greater Philadelphia study quantifies benefits associated with the Science Center’s business incubation services including job growth, salaries and wages, economic output, and fiscal impact. 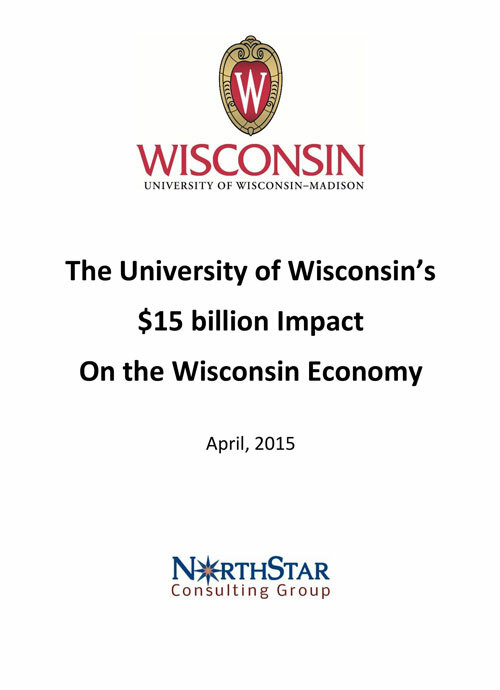 The University of Wisconsin-Madison, UW Hospital and Clinics and the university’s affiliated organizations — including the University Research Park — and startup companies support 193,310 Wisconsin jobs and generate more than $847.5 million in state and local tax revenue. That’s up from 128,146 jobs and $614 million in tax revenue the last time a similar study was completed in 2011. The UW–Madison is the fourth largest research institution in the nation, with awards in 2013 reaching more than $1.1 billion, and has consistently ranked among the top five universities overall for research funding secured from all sources —federal, private and state — for more than 20 years. UW-Madison research has fostered the formation of at least 311 startup companies in Wisconsin. The startup companies support more than 24,972 jobs and contribute approximately $2.3 billion to the Wisconsin economy, bringing the total estimated economic impact to $15 billion. The UA Tech Park is a significant economic engine for Tucson, Pima County and the state of Arizona. The Tech Park helps to attract new businesses, grow established businesses, launch new companies, commercialize new technologies and create high-paying jobs. 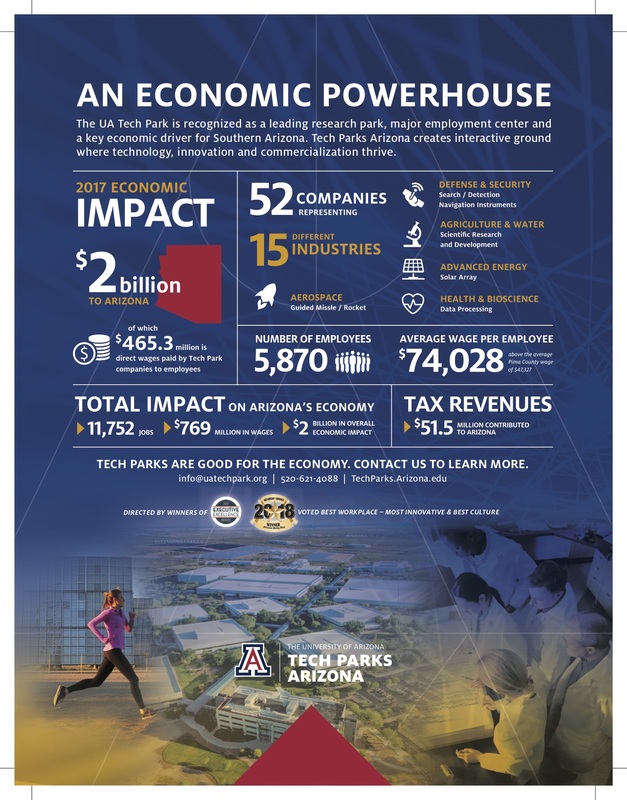 Annually, the UA Tech Park generates an economic impact of more than $2.3 billion in Pima County. The UA Tech Park is home to more than 40 tenant companies that employ nearly 6,500 people. The UA Tech Park created over 19,000 jobs in the regional economy. This figure includes direct, indirect, and induced jobs. 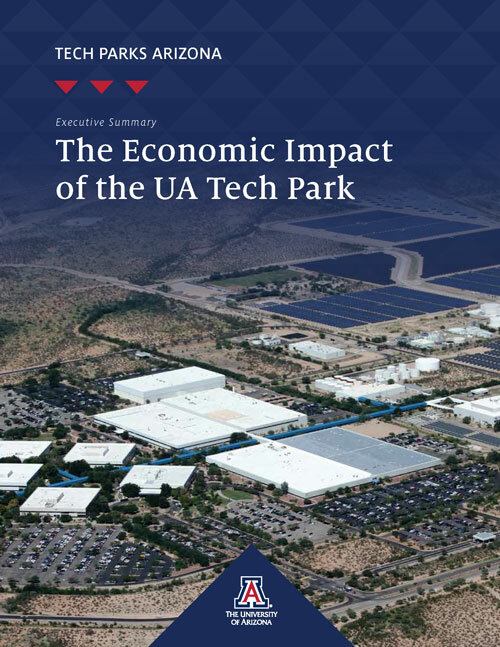 The average annual salary of an employee that works for a UA Tech Park tenant was $91,145, nearly twice the Pima County average of $46,363. 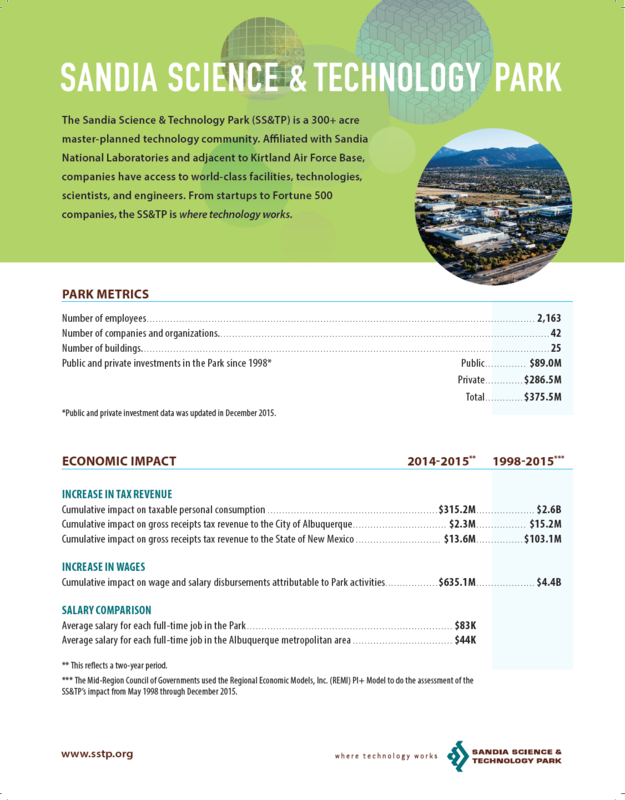 The UA Tech Park generated an estimated $105.6 million in tax revenues for state, county, and city governments. The University City Science Center is a hub for innovation, entrepreneurship and technology commercialization. For more than 50 years, they have aided scientists, entrepreneurs, startups, and growing and established companies throughout the Greater Philadelphia region as they move their technologies into the marketplace, where they can benefit the region and the world. The 2014 Annual Review follows the example of their innovators — through a fresh, sustainable and entrepreneurial presentation approach — by being completely digital with their micro-site. 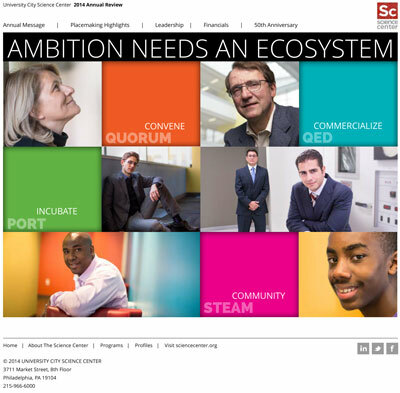 The site embraces the Science Center’s tagline: Ambition needs an ecosystem. The Review highlights the two paths that one can take through the Science Center—the literal and the metaphorical. The stories outlined in their annual review and the profiles of the people behind them illustrate both paths.